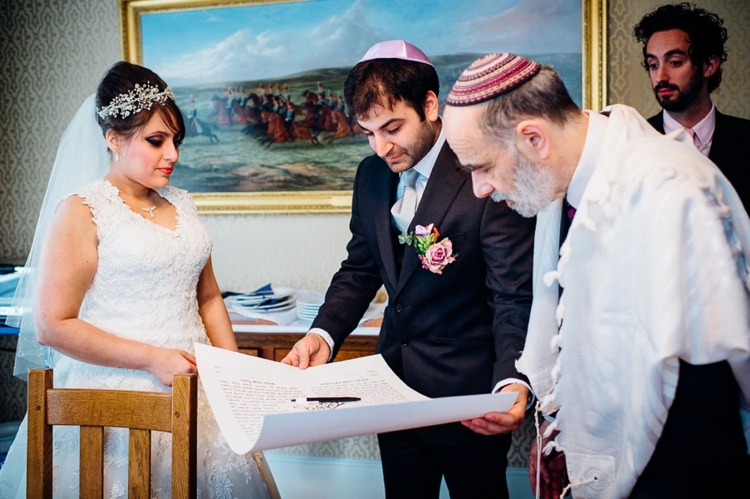 My family is Turkish, and Turkish-Jewish weddings are large affairs! We were looking for a large venue for 300 people that wasn’t a hotel (Eyal was particularly keen that we avoid swirly carpets!) 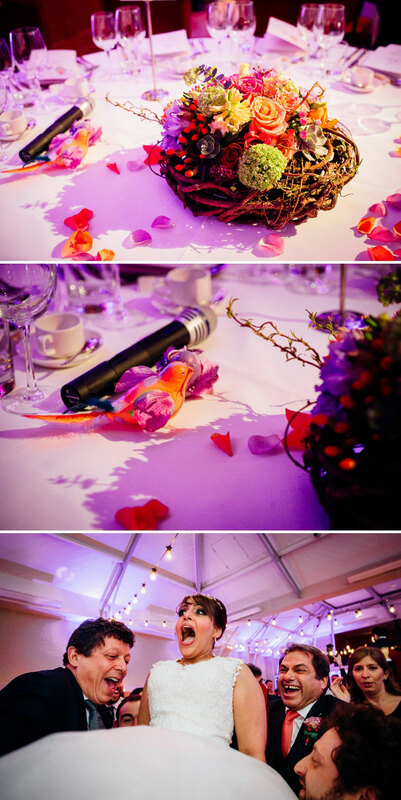 and that we could transform between the day-time ceremony and evening reception. 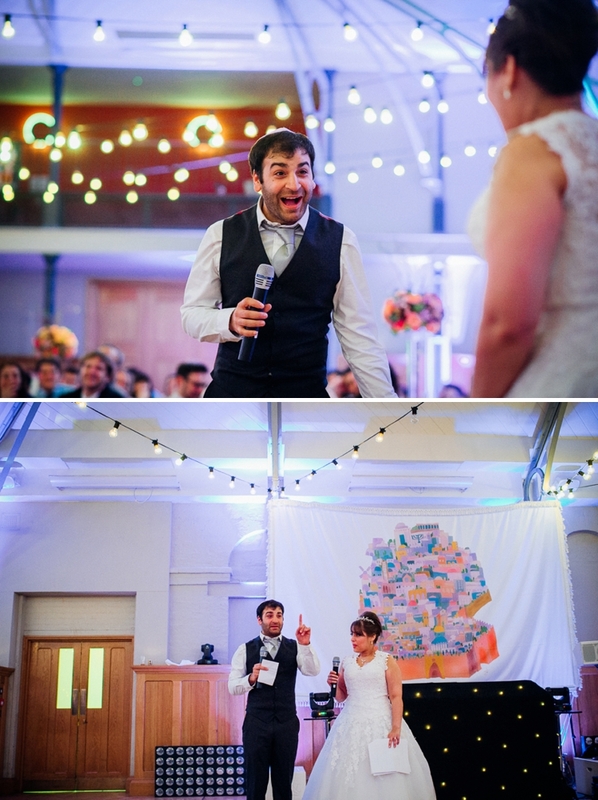 As a theatre lighting designer, Eyal had a vision for our spring wedding — a chuppah in daylight, and an evening reception with festoon lighting with blue uplighters to give it a ‘midnight garden’ feel. 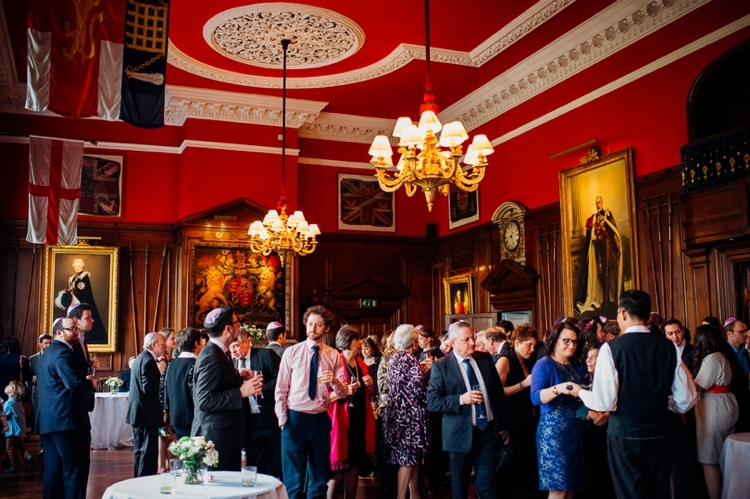 We visited a fair few venues, but fell in love with the HAC’s beautiful Prince Consort Room. The skylight promised to drench us in natural light during the day, and the wood floors, balcony and metal girders had plenty of character, but were subtle enough to weave into our design for the day. 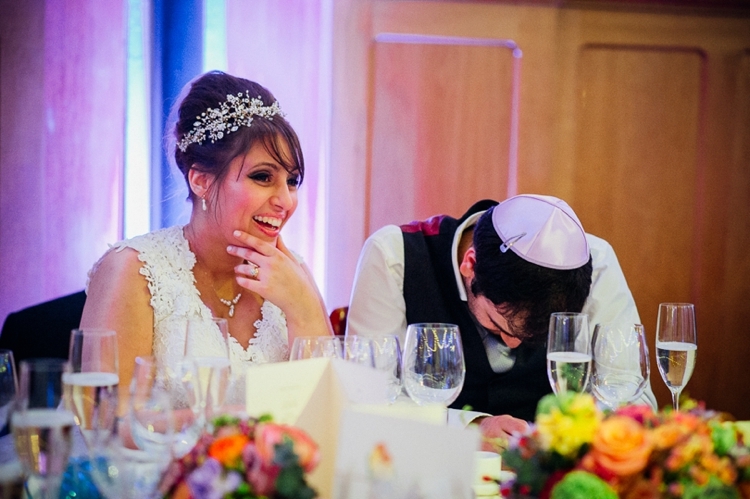 Eyal works in theatre, and I work in events, so our wedding was an amazing opportunity to work as a team on creating an experience for our family and friends! We did most of the planning ourselves with my parents and Eyal’s dad, and couldn’t have pulled the day off without the support of ‘Team Wedding’ — our amazing BridesMates, best man and a whole bunch of our talented friends. 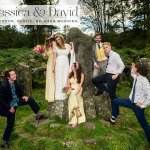 Their generosity with their time and efforts blew us away — building our website, type-setting and printing our ceremony booklets, dashing around for us in the last week, and even singing in the ceremony. Having set the wedding date for the end of March, we both love bright colours, and chose purples, corals and greens which suggest the bursting forth of spring. 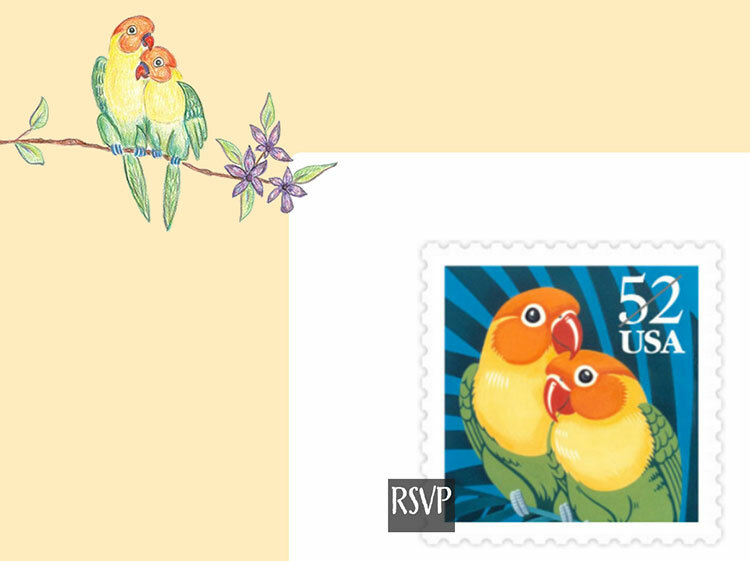 We both love birds — budgies, parrots and Fischers lovebirds especially. When we first got together, Eyal went off travelling for 3.5 months to South America. While he was away, I posted a picture of a beautiful pillow with two budgies by Chloe Croft that I’d seen online. A week later, a parcel arrived — he had ordered the pillow for me as a surprise. The budgies kept me company until his return, and have been with us ever since! 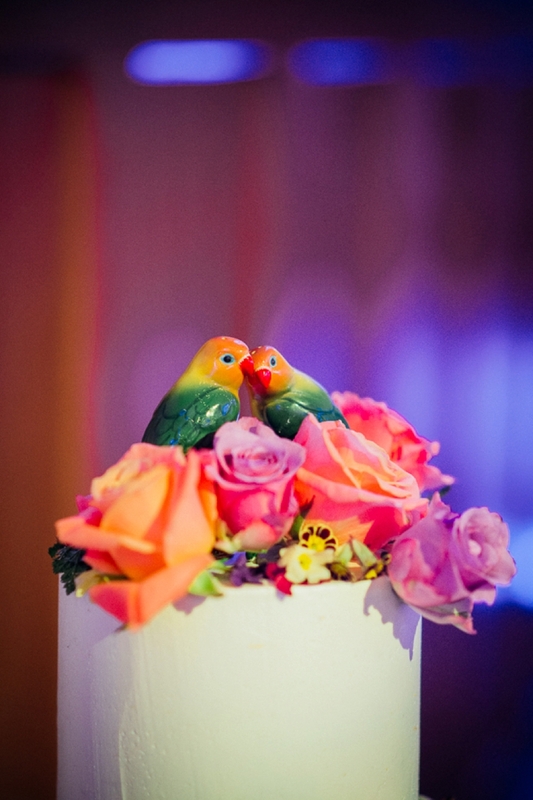 It’s no surprise then, that we wanted to incorporate life-like birds into our wedding celebrations. My cousin, a graphic designer based in Istanbul, kindly offered to help us design our stationery. She typeset our invitations and found the playful Buckley font for our names. We wanted to feature birds, but couldn’t find the right images. In the end I drew a sketch of two lovebirds and sent it to Joelle saying — ‘Something like this.’ She replied, ‘These are gorgeous, why don’t you tidy this up and use them? !’ So they became our wedding ‘logo’ or mascots. 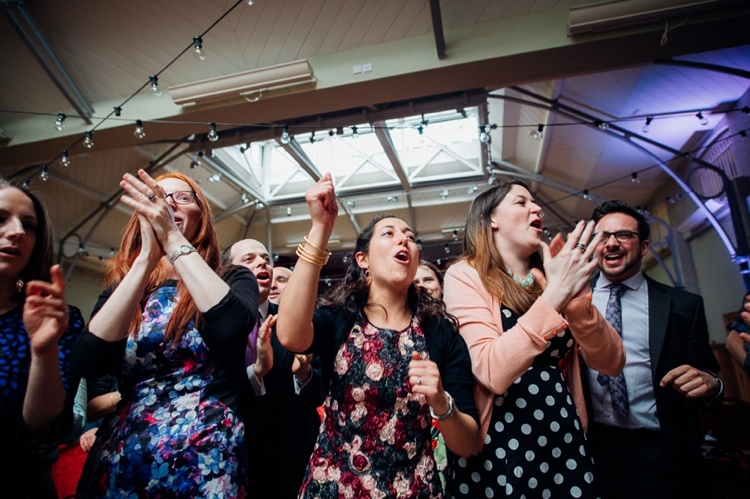 We did all our RSVPs via our amazing website, built by my brides mate Shiri Stern. It cut down on so much admin, and people loved the stupid jokes that were so us, like the cartoon about what to wear, and the virtual bubble wrap on the gifts page. I had a few hair and make-up trials which weren’t quite right before I found Maegan and Glynn — so I’d advise brides to persevere and have several trials to find the right stylists. Maegan of Maegan’s Make-up had done my bridesmaid Alma’s make-up beautifully for her wedding last year, so I looked her up. She was brilliant with my sensitive skin, and we had great fun experimenting with feline smoky eyes and berry lips. She patiently worked with me on the perfect flick and I learned loads of make-up tips from her at our trial. I also have to thank her for convincing me to try MAC lashes, which I would never have considered before. Maegan also did my mum’s make-up, matching gorgeous burgundy lip colour to her wine-coloured dress. I can’t recommend Maegan enough! Glynn Miller gave me a beehive chignon that stayed put all night. Glynn is fantastically down-to-earth and was a great calming influence. on the day. He set my straight hair in rollers under a brilliant portable silver drying hood that looked like an elephant’s head (!) and then teased it into a style around my hair vine in about 15 minutes flat. He also gave my mum and grandma fab blow dries. My everyday style is somewhere between 1950’s and 1980’s! I love wearing circle skirts and dresses with nipped-in waists, as well as bold shoulders and intricate prints and detailing. I was looking for a princess or a-line style, and having tried on a few gowns, soon found that I liked V- and —heart-shaped necklines. My Justin Alexander gown from Angelica Bridal stood out the moment I put it on. My dad and bridesmaid Shiri were with me, and their jaws dropped — I guessed that was a good sign — and then I saw it in the mirror and I didn’t recognise the 1950’s movie star looking back at me! The lace flowers reminded me of wisteria, one of my favourite flowers. And the wide skirt was something you could only wear once in a lifetime! I went away to think about it, but returned with my mum and dad a few weeks later and it was a done deal. I am a big hat and hair-flower person, so was thinking about a flower for my hair. But then my mum and I met Gillian Million at Brides The Show and fell in love with her ornate hair vines, made of pearls, crystals and vintage cabochons. I ended up visiting her gorgeous studio in Twickenham, where she and her team helped me choose a custom ‘Eleanor’ vine which echoed the lace of my dress. I also chose a simple pearl necklace and earrings from her selection. I borrowed a chapel-length veil from my dear friend Gaby, dotted with crystals and pearls. It was perfect, and so meaningful to wear it as she had on her wedding day. Some of my favourite shoes for dancing have come from Freed of London, the dance specialists. It was amazing to discover that Rachel Simpson had done a collaboration with them, so I could have my comfy vintage cake and eat it! I chose ivory sandals with silver glitter details for just £80 from Freed’s shop in St Martin’s Lane. Hardly anyone saw them on the day because of my huge petticoats, but I flashed them a few times, and they were so comfy. I know I’ll wear them again with black or bright-coloured dresses — probably with my Gillian Million tiara, too. Eyal’s everyday gear is jeans and hiking boots, but he does enjoy a good waistcoat and a pair of striking socks (usually odd ones!). 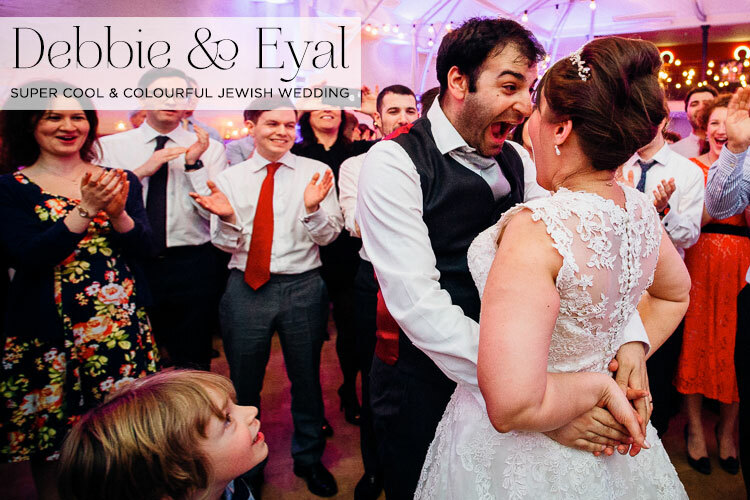 Eyal wore a beautiful grey suit from Charles Tyrwhitt, a silver-grey tie and a gorgeous waistcoat with a deep red back. 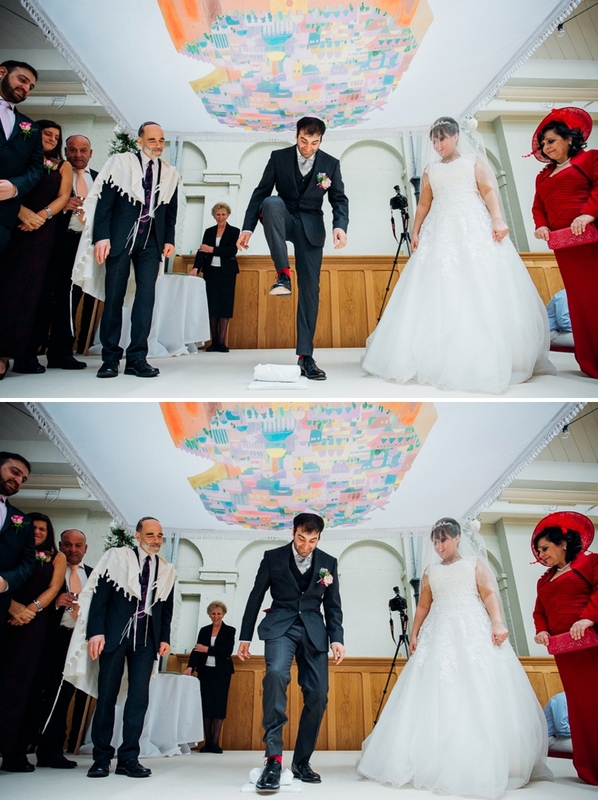 His bright red socks were a highlight — he enjoyed flashing them when he lifted his foot to smash the glass in the ceremony. 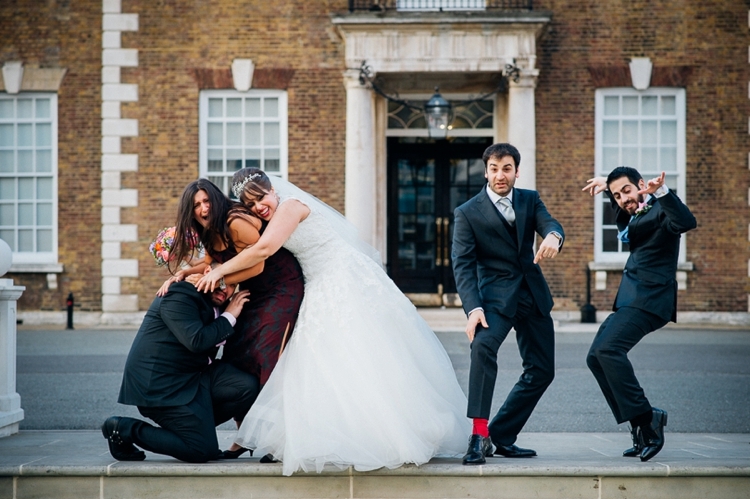 I told my ‘BridesMates’ our colour scheme and encouraged them to choose their own dresses. The girls all wore dresses they already had — Alma in sea-green, Shiri in coral, Lidija in deep purple — and Joe chose his own tie. Having been a bridesmaid before, I knew that although bouquets are beautiful, it’s also important to have your hands free! So we asked our florist Kenza to create some bespoke fresh flower hair clips for the girls, as well as a buttonhole for Joe. They were absolutely stunning! I wanted to give my BridesMates gifts that they could use on the day, and keep for the future. I make jewellery as a hobby, so made earrings for the girls with rose quartz and Swarovski crystal beads. Joe got a bespoke hip-flask. And I made them each a card to match their outfit colours — ‘Best Friends are a Girl’s Diamonds.’ I also gave them each a little decorated packet of tissues to take to the ceremony — and saved a couple for my mum and grandma too! Our ketubah is a stunning tree design with our Hebrew names written in the leaves, by Josh Baum of Alifs In Wonderland. 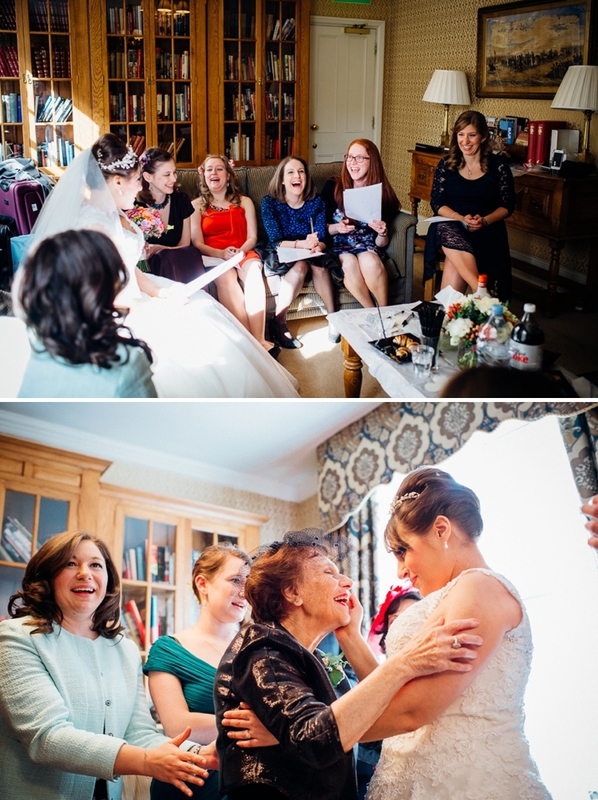 Before the ceremony, I had a ‘bride’s tisch’ upstairs in the library with my closest girlfriends and family. My girlfriends Gaby, Micky, Rebecca, Juliet and Tasha created a little ceremony, with singing, speeches, snacks and toasts. There were many tears of joy, and it was the perfect way to focus me and ease my nerves before the ceremony. It was really important to us that the ceremony was meaningful and chimed with our values, so we spent a lot of time planning it. We took a marriage class at our Masorti synagogue, and spoke to several friends, and learned about the many options available to us to make our marriage ceremony more egalitarian and inclusive. We invited several musician friends to sing liturgical songs which we had chosen – they hadn’t worked together before and had few rehearsals, but their incredible sound together had the whole house in tears. 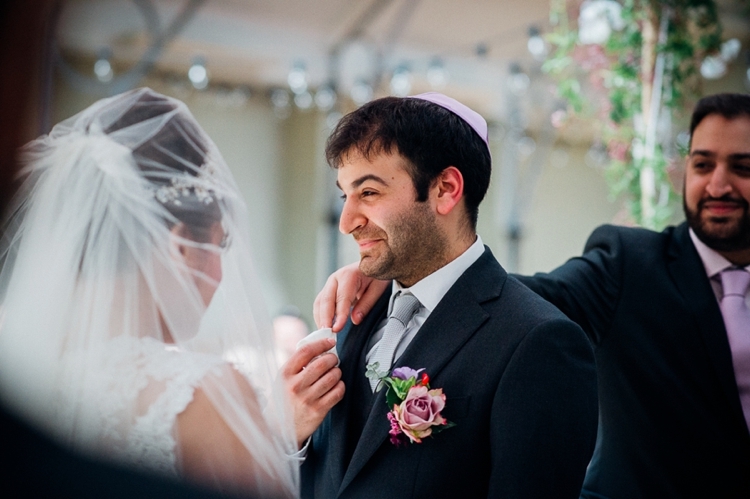 Placing short musical interludes at key moments in the ceremony, such as between the exchange of rings and the Sheva Brachot, allowed us to look out at our friends and family and include them all, and to bring them all closer to us. It all goes so fast that it was really special to stand still and absorb the huge amount of love in the room. We had family members read the Sheva Brachot. Eyal’s close friend Alon read a special ‘Eighth Bracha’ written by Jewish educator Chani Smith, which seeks to recognise all different kinds of love, including familial, heterosexual, homosexual relationships as well as friendships. You can find a recording of the blessing on Alma and Dan’s wedding website. Designing our chuppah turned out to be one of the most special aspects of the whole wedding. 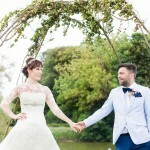 We looked at lots of chuppah designs, but couldn’t find one that we liked. My mum sent us pictures of cloth designs by an Israeli artist, featuring trees, birds and the old city of Jerusalem. Eyal commented that his mum, who passed away four years ago, had created silk paintings that looked similar, and showed us a photo of an incredible image she’d painted of a peaceful Jerusalem. My dad suggested that we have it printed and enlarged on fabric, and have this as our chuppah cloth – and we all knew it was the answer. We had it photographed to create a digital image, and printed, lined and trimmed with purple in Turkey, with the help of family friends. It was stunning, and it was wonderful to look up during the ceremony and have Eyal’s mum close by in such a tangible, meaningful way. We borrowed chuppah poles, and our florist Kenza decorated the corners with simple flowers and foliage. We hung the design up during the reception, so that everyone could enjoy it throughout the evening. Unforgettable by Nat King Cole – We once danced to it with Eyal’s grandparents in their living room – still in love and dancing after almost 60 years. Thinking Out Loud by Ed Sheeran – Sounds like a classic, like Marvin Gaye or similar, slinky and romantic. 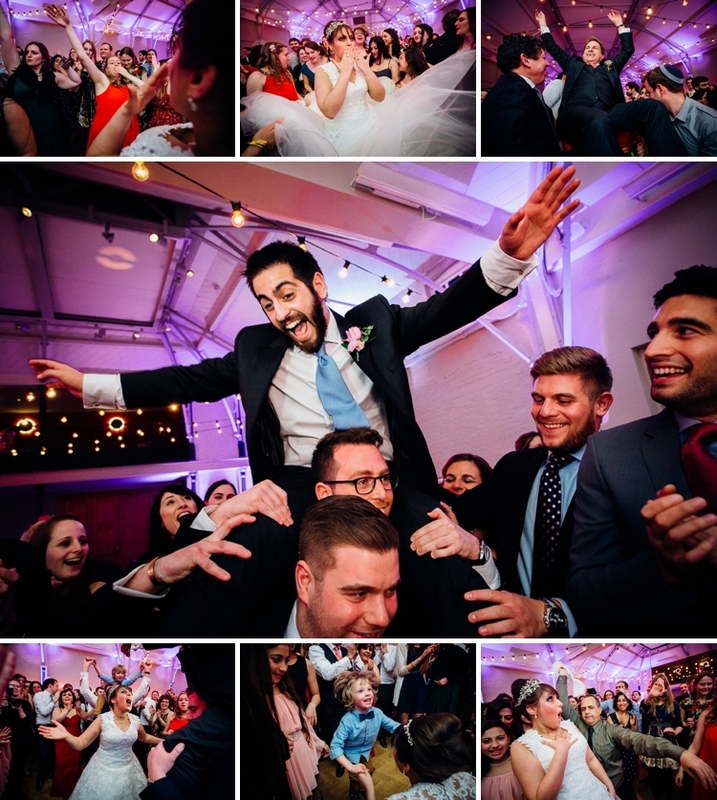 The transformation from day to evening was so dramatic and immersive, with the festoon lighting, purple-blue uplighters, Kenza’s flowers, floating candle arrangements lining the walls, and the chuppah cloth displayed on the wall. I snuck a look before anyone came in, and it took my breath away. The Jewish dancing flew by in a whirl of smiling faces, laughter, glimpses of lights and flowers. One of my favourite parts of the whole day. The Jewish dancing flew by in a whirl of smiling faces, laughter, glimpses of lights and flowers, and it was one of my favourite parts of the whole day. Sky Full of Stars by Coldplay – One of our favourites, we wanted to start the dancing by recognising what a shiny bunch our friends and family are. Cheesy but true. And it got the whole room on its feet! Our final dance was a slow cover of I would walk 500 miles by Sleeping at Last, which we slow-danced to in a circle of all our friends… but to send the party out with a bang, we had the DJ drop the original, and we all jumped like mad and sang our hearts out. Our DJ was Max from the Wedding Smashers who was forever on hand to find obscure versions of songs we liked and to throw in all of the extra bits to make the evening incredible. Kenza of Peppermint Poppy was an angel who brought our midnight spring garden theme to life. We told her we wanted purple, coral, green and white flowers, that referenced the colours of our chuppah and our invitation lovebirds. 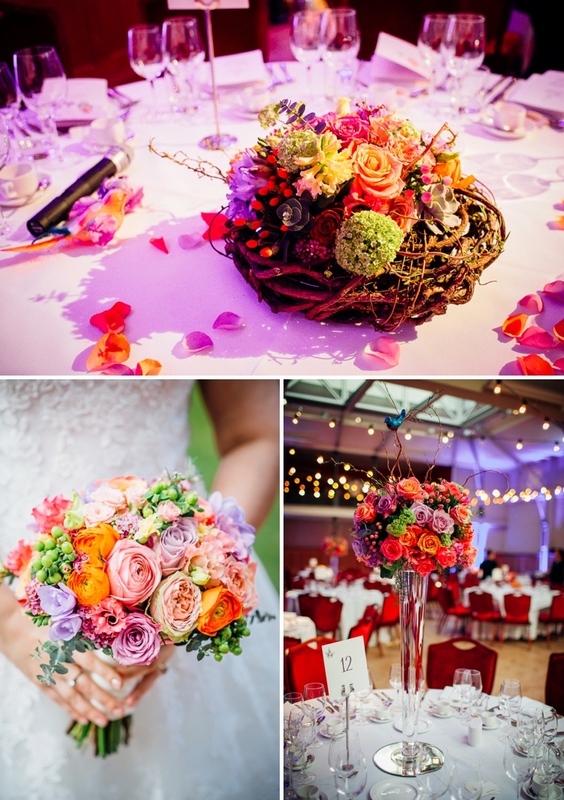 Kenza not only went to great lengths to source incredible coral blossom, that had not come out yet in most places because of inclement weather, but she also worked creatively with the bird theme, creating outsized sculptural ‘nest’ arrangements for centrepieces. She included little birds on clips that I had bought and made in her designs. She also created a huge vernal arrangement with hanging candles in the entrance, an absolute beauty. 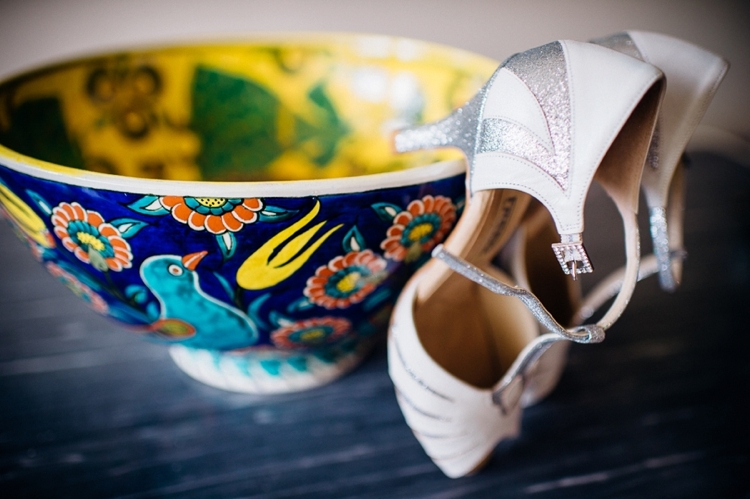 The overall effect was both whimsical and modern, like no wedding flowers we’d ever seen! I asked for memory lane roses in my bouquet, which Kenza wove together with peach, white and orange flowers and green buds. We found Marianne Chua through Smashing the Glass! We loved her website, and on meeting her at our mutual favourite cafe, discovered that she was delightfully bonkers and put us both at ease. We knew she’d capture the intimate moments in a laid-back, documentary style without being invasive, and bring a sense of humour to our pictures. We could tell she wouldn’t force us into taking the classic ‘must have’ shots if we didn’t want them! 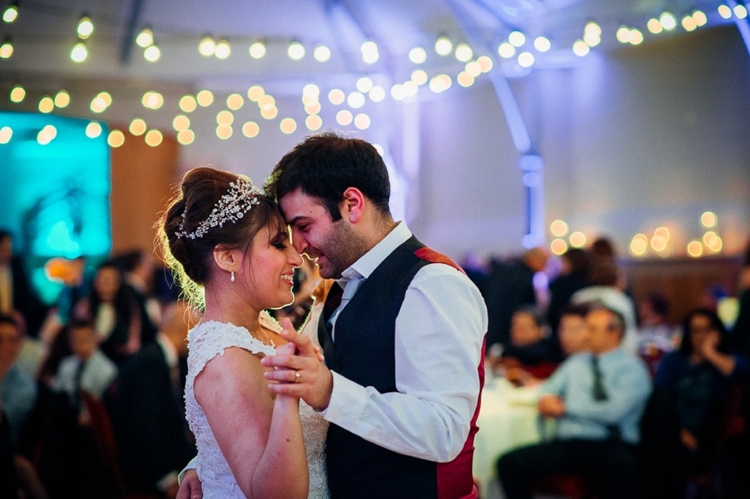 We couldn’t be more delighted with our pictures – we look like us at our very happiest, and our friends, family and all the tiny touches alike have been captured beautifully too. Michelle of the Lavender Bakery designed us a delicious lemon cake with Italian meringue icing – which is actually made in a kosher kitchen, FYI kosher brides. She decorated it with edible flowers, and placed our vintage lovebird salt-and-pepper shakers from our home on top (cake toppers are so expensive!!) We also had traybakes of chocolate, lemon and lavender cake, which was just as well because in all the madness we forgot to cut the cake! We ended up sharing out cake the whole week and spreading the love, and have the top tier in my parents’ freezer. 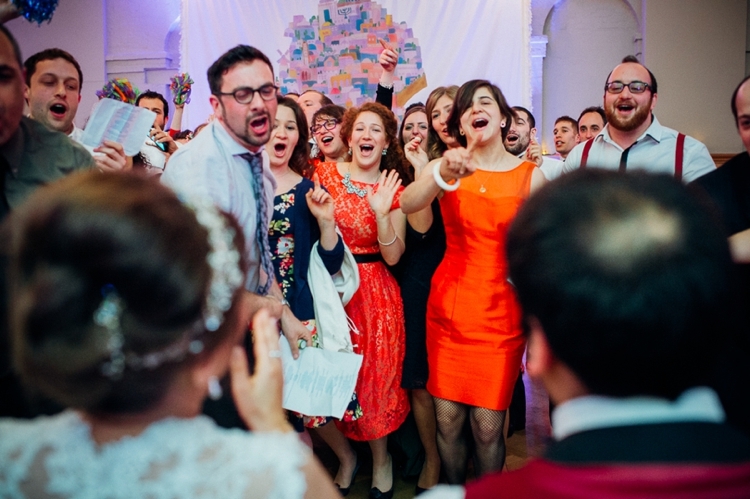 Our friends performed a surprise song for us – a version of Taylor Swift’s Shake It Off which became ‘Mazal Tov’! 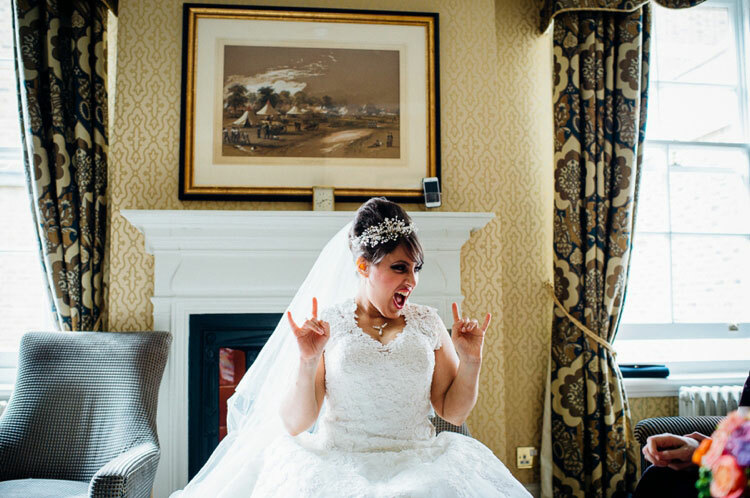 We were blown away because through our hen and stag lists, they had managed to send the lyrics to loads of people who had no connection to each other. It was totally overwhelming to have 60 friends from different times in our lives singing and dancing for us all together! At the end we got up to hug them, and were enveloped in the biggest hug of our lives. So much love. We had a Photo Booth from Just Pose, which was brilliant. They give unlimited prints to guests, and we laughed for an hour when we received the digital copies afterwards. We gave out traditional Turkish chocolate sugared almonds with a big scoop, which went down brilliantly, and my brother was in charge of dance floor toys. He brought flower garlands, giant sunglasses and inflatable parrots (yes!) to the party, which were in keeping with the theme and went down a storm. We sent people home with almonds, garlands, Photo Booth pics, flower arrangements and cake. We still visit people’s houses and discover the little birds from our flower arrangements in their living rooms, or their Photo Booth pics on their fridges. We’ve also been eating chocolate almonds for months! 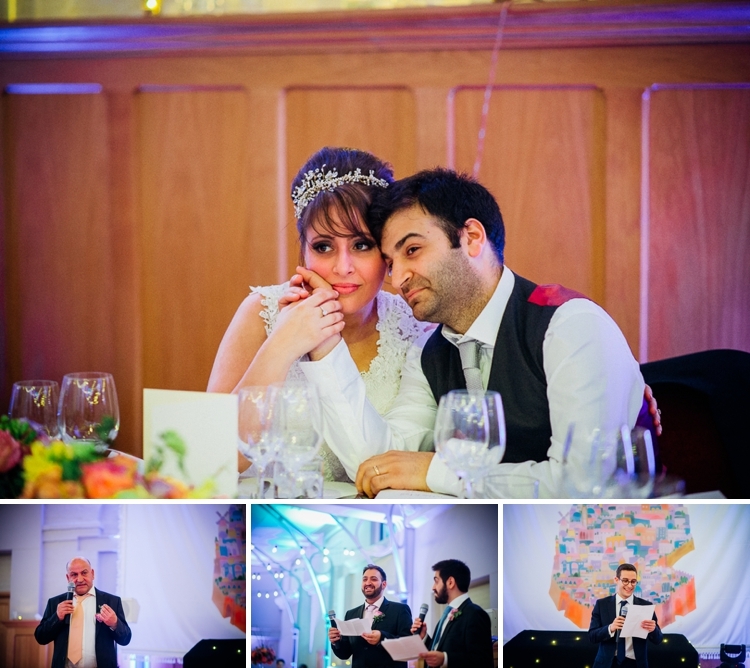 We both wanted to speak, rather than having the traditional groom’s address, and that was an amazing opportunity to honour and recognise the love and support we’ve enjoyed. We were also able to honour the memory of Eyal’s mother, and my cousin Alp, whose absence we felt so keenly. Finally, we were able to share some stories which illustrate why we love each other so much, and having our dearest ones witness that was just phenomenal. Our brothers Adam and Titch (Jonathan) gave a hilarious speech together. It means so much to us that we all get on with each others’ siblings. And can happily embarrass each other, with the utmost affection. The silly photos we took outside the HAC with our siblings are absolutely hilarious! Our grandmothers, Esther and Cilda, looked stunning and so happy. We managed to grab a photo with them both before Esther left after dinner, and it is one of our most treasured ones. I’ll never forget my dear cousin Ilona and her three daughters, who’d travelled from Israel, coming into my tisch and bursting into tears. Lots of hugs, and smiles, no words needed. 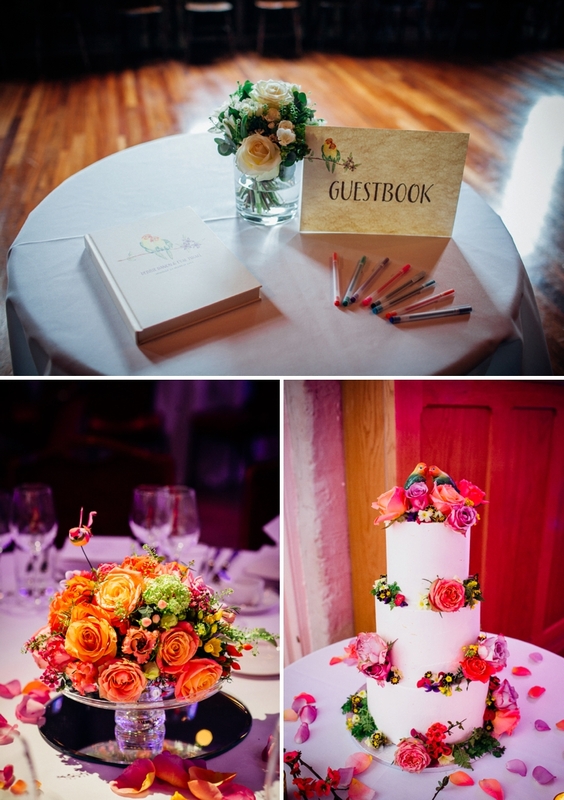 Such a simple, affordable thing – we put stickers on the guestbook table. People went mad expressing themselves with the stickers, getting creative with their messages, and we even spotted people dancing later with stickers on their faces! Keeping your family happy is really important. Talk openly and honestly with your family about what you expect a wedding to be like. 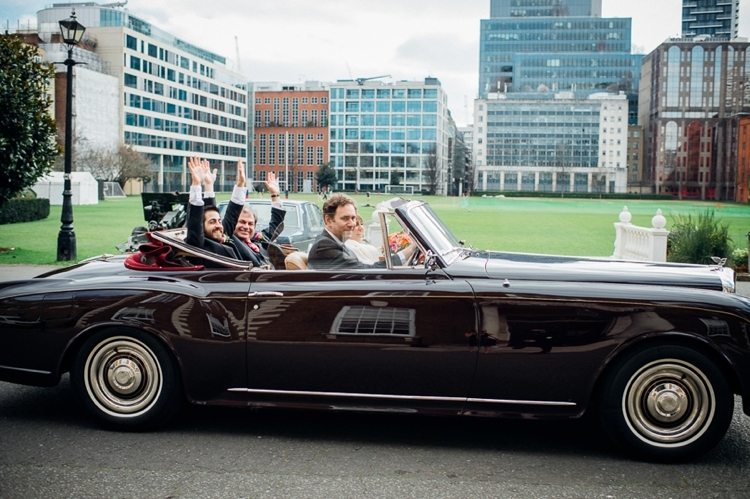 It took us a long time to understand the differences between Turkish, Israeli and British cultural understandings of what a wedding is and should be, but once we did, we were able to make agreements, compromises and creative decisions. 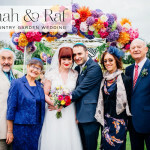 We found that creating a meaningful ceremony and chuppah, making the whole experience accessible and fun for people, and bringing out the garden theme in fun, quirky ways, were our priorities, so we always kept the big picture in sight. And we gave up on some really cool ideas, but that didn’t matter. Perspective is important. Forgive each other (that goes for partners and families alike!) Everyone’s under pressure, not just from planning the day but for the big changes a marriage signifies. 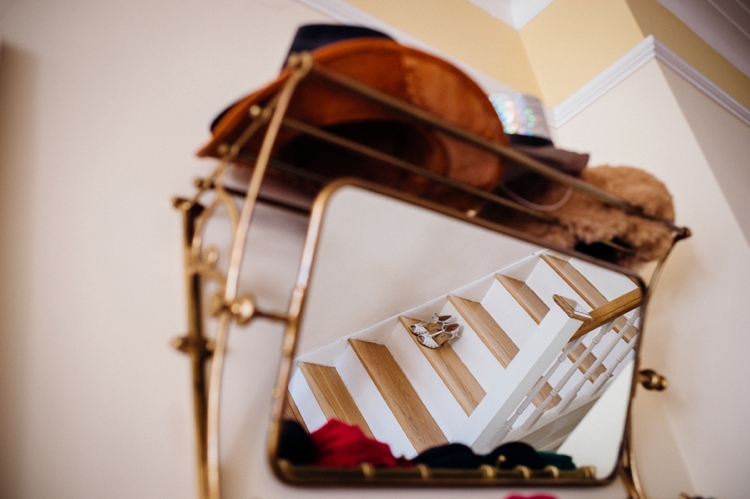 Even though people live out of home for a long time, marriage can mark a subconscious transition and a sign of independence from parents and siblings, so while people might seem angry, stressed or upset, it’s often all part of the process. You will forget it all when it’s over! On the day, zoom out, but also be present. Enjoy it, soak in the experience, and talk about them over the following days. Ask your friends about their experiences too – they will have totally different stories and angles that will enrich your memories. Practical stuff: website RSVPs are amazing, don’t do paper; create a joint email address; divide responsibilities; don’t get ‘analysis paralysis’ over tiny details, sometimes you just need to trust your gut and make a decision; and do ask for (but not demand!) 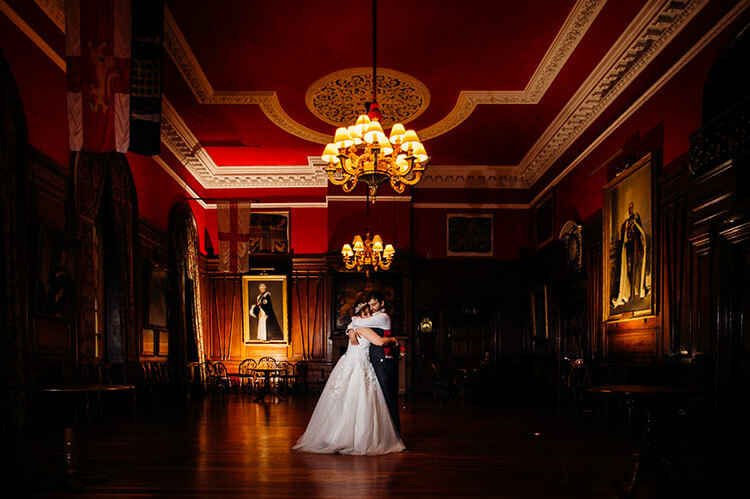 help – our Team Wedding were incredible, and we received so many offers of practical help that made a huge difference to our sanity. 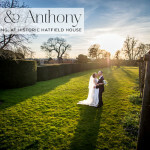 Lovely wedding and gorgeous images. Lots of smiles and happy faces! 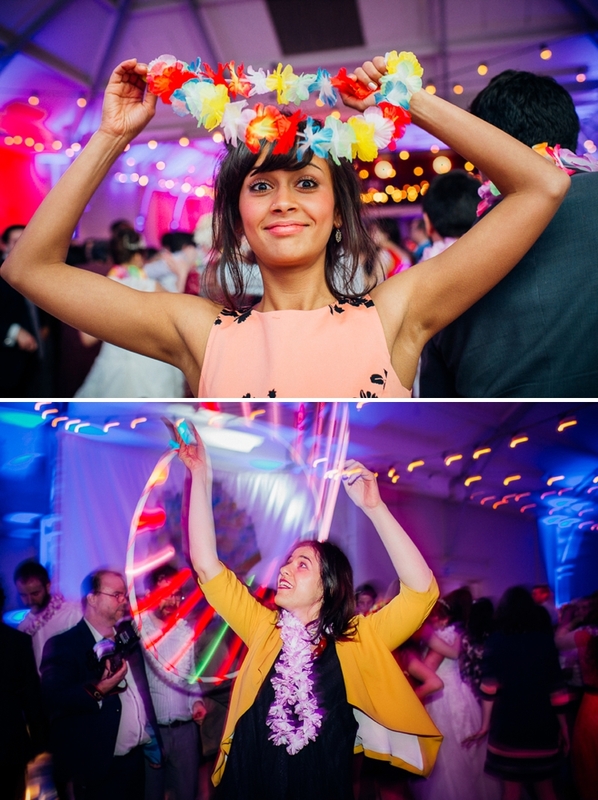 Great photos, looks like such a fun wedding! Looks like such a fun wedding!!!! Oh the joy in these images. 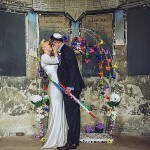 Love the Bridesmates idea and no bouquets. MOB in red…. Gorgeous! These photos scream out at you what a fun wedding this was. The images are full of personality. What a wonderful looking day. 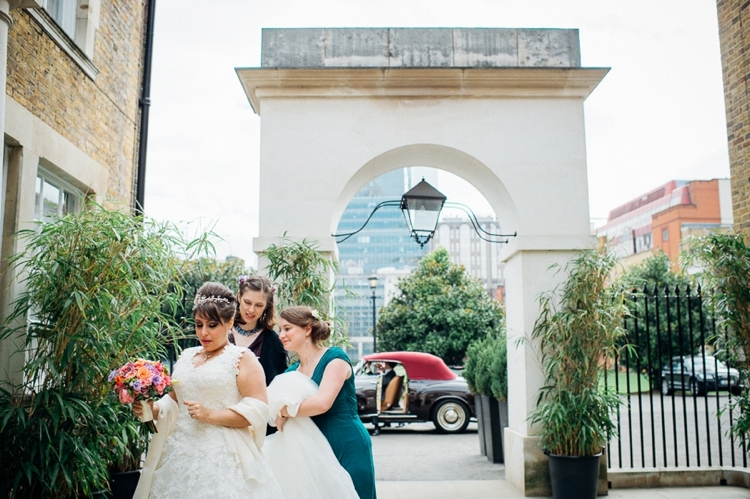 I have worked at the HAC before – ace location – a real gem tucked away in London! !